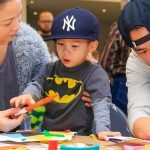 With events for little kids, big kids and the whole family, there is fun for everyone at the AGO every Sunday, November through April, with a different focus every month. Free with museum admission, at the Weston Family Learning Centre on the lower level. Monthly themes for 2018 and 2019 are added as they become available.